Need a pre-purchase inspection? Our highly-qualified inspector will make a comprehensive inspection and provide a detailed report containing everything you need to know. The best prices and most qualified inspectors in Ipswich, book now to buy your new house with confidence! Cutting-Edge Technology: We use the latest thermal and moisture sensing technology available. Yes, you can be on-site when the inspection is taking place. We do ask that you allow the inspector to conduct his inspection unhindered and save questions until he is finished. This helps to ensure a thorough and uncompromised report (you can discuss issues at the end). Our condition reports follow Australian Standards and Quality Guidelines and are recognised by real estate agents and solicitors on the Ipswich. We’ve designed the report to give you the information you need to make well-informed decision about purchasing a property (or not). Our reports are easy to read and may even help you dodge a bad deal that could costs you thousands in repairs. Here’s how we prepare your condition report. While the agent has no doubt told you of the properties “excellent or as-new condition” – it’s best practice to get a second opinion of an industry expert. Painted areas could in fact be hiding rotting frames, or flaws that will need the expensive maintenance. To keep protected, your Ipswich inspector will be on the lookout for defects and homeowner cover-ups to determine the actual extent of the damage. They’ll bring ladders, powerful torches and specialist devices to inspect visible areas. They’ll even use radar and thermal equipment to check inside the walls for leaks, moisture and termites. And unlike some other inspection services that will change you extra for these services, they’re all included in our base fixed cost. We’re here to protect your wallet! Pest inspections used to mean ripping out sections of the wall. Not only are these methods messy and intrusive, they often miss deeply housed nest areas (and lead to nasty surprises down the line). Each RBI Ipswich inspector is equipped with (and trained to use) the Termatrac device – the only device that can precisely detect, locate and confirm the presence of termites without needing to penetrate walls, floors or ceilings physically. They’ll inspect every visible and accessible area of the property for both current and potential nesting hotspots. Prepared according to Australian Standards AS4349.1-2007 and AS4349.3 and written in layman’s terms, our inspection reports are straightforward for you to read and confirm to legal requirements. We’ll highlight everything you need to know, including any safety hazards or costly repairs you may face, and we provide photos so you can follow exactly where the issues lie. Call ☏ (07) 3205 8305 to get a sample report. Your pre-purchase building and pest report conforms to Australian Standards AS4349.1-2007 and AS4349.3, making them fully recognised and accepted by your lawyer and estate agent. Anything that places your investment in this property at risk will be highlighted in the report, which you can use as grounds to terminate a contract or put you in a stronger position to negotiate with the seller. What does this mean to you? Buy your next home with the confidence of knowing that you are paying the right price and getting the home that you need. What does this mean to you? Buy your next home with the confidence of knowing that you are paying the right price and getting the home that you need. Get Ipswich Building Inspection Today. Why Choose Rapid Building Inspections in Ipswich? Our inspectors are highly-trained and come to you with long experience in the building industry, making them the ideal ones to spot potential concerns that some other inspectors may miss. Our inspectors are fully trained and qualified to Australian Standard AS4349.3 and follow all industry best practices, and are authorised to inspect throughout Queensland. The best qualified inspectors and the latest Termatrac T3i and Tramex Moisture Encounter Plus – you can be assured that any presence of termites will be detected with no adverse impact on the building itself. We pin-point significant heat sources that suggest termite activity within the building structure with the Remote Thermal Sensor and accurately detect and confirm termite presence with the Termite Detection Radar; we can also locate and trace termite nests and entry points. 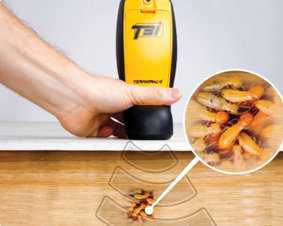 With the ability to identify termites through any common construction material using a calibrated radar signal, leaving the termites undisturbed, the Thermatrac device then accurately detects their activity. With our Thermatrac T3i unit, we can measure and record the different moisture levels in in building materials without damaging the building itself. Concentrated moisture in most surfaces indicates that the presence of termites can be accurately detected. We know that timing is sensitive – as long as we have received your payment by the time the inspection concludes, we guarantee delivery of the report within 24 hours of the inspection or you get your money back. We’re fast but we never cut corners, every inspection report has to pass stringent quality control before it gets sent to you. 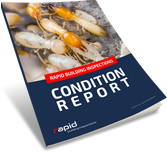 Our commitment to you is that we will provide a totally unbiased pre-purchase report on the condition of the building and the presence of any pests at the best price – guaranteed. Our inspectors have minimal interaction with the property seller and estate agent, they are therefor one reason and one reason only: to get on with the job of inspecting the property and getting the report back to you – rapidly. All we ask from you is to ensure that our inspector has access to the property at the appointed time – if this is not possible, please notify us 24 hours before the booking time so that we can efficiently re-organise scheduling. Just call us, let us know the address of the property and your preferred time slot, and we’ll send our inspector over. Inspect gutters, tiles and structural damage. Look for visible asbestos as well as insulation and timber-related issues. Inspect cracks, structural damage, pipes and groundwork. We’re local in Ipswich and service CBD, south-east Queensland and south-west of the Brisbane metropolitan area. Just give us a call, and we’ll send over one of our Ipswich inspectors ASAP. Do you check the loft and roof? As long as our inspectors are able to gain access. This is another way we provide best value Building Inspections in Ipswich.